Ok, so it's not little, but DL's Main Street has more charm, antiques, detail, and gorgeous signage than WDW's. They also had a spectacular amount of vehicular traffic going while we were there: the horse-drawn trolley, two cars, a double-decker bus, and the firetruck, which you can see in my first picture. The Penny Arcade is probably my favorite spot on Main Street. I love the vintage pipe organ and games. A peek at the scroll in the pipe organ/player piano/band in a box thingy. The cabinet with the brass pipes is the top half of the music thingy. Kind of a dark carnival vibe going here. I like it. 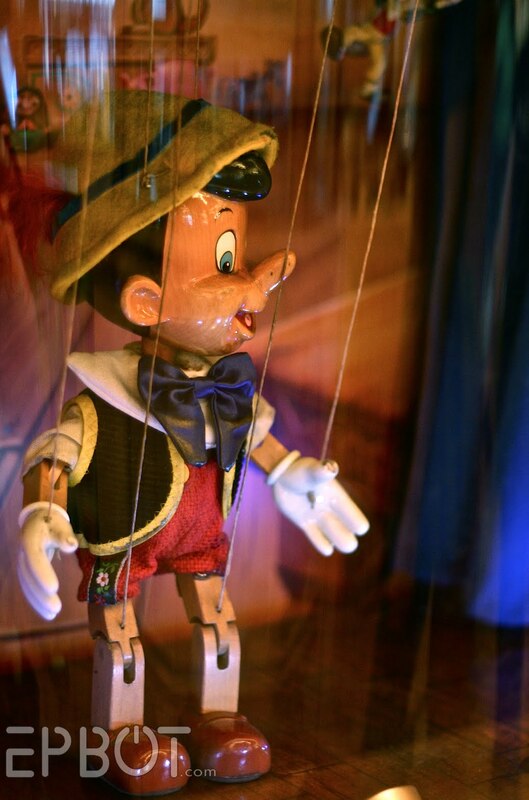 For a coin, you can make Pinocchio dance. 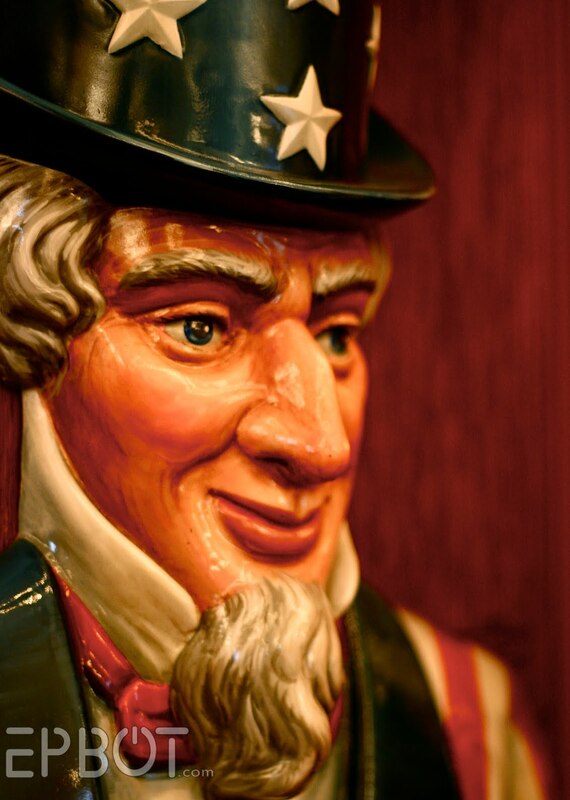 Or squeeze Uncle Sam's hand. Now, you have to understand: I've wanted to see the Dans on this bike since the first time I visited Disneyland, back in 2005. Walt Disney himself ordered the bike, it was custom built by Schwinn, and WDW doesn't have one. In the three visits we've made to DL since '05, John and I always just missed the Dans, or the bike was in the shop, or they weren't riding it that day. So, I didn't have very high hopes when I asked them about it after one of their performances. When they came pedaling down the street, I was standing on the corner with my camera hopping up and down like a five-year-old. I'm not sure if I flattered the guys or frightened them. Hee. Oh, and see how crowded the street was? That's why they weren't going to ride; it was insanely busy. And lest it appear I only love the Dans for their mode of transport: I absolutely adore four-part harmony. Always have. I don't have much musical ability myself, but I did sing alto/tenor in a small ladies' a capella group as a teen, and loved every minute of it. Check out all the detail! Does this count as a statue? Hm. Whatever. It's cute. I have to thank James & Kim Keeline, organizers of the upcoming Tom Swift convention in San Diego, for telling me about this next Disney detail: The Lilly Belle Passenger Car. 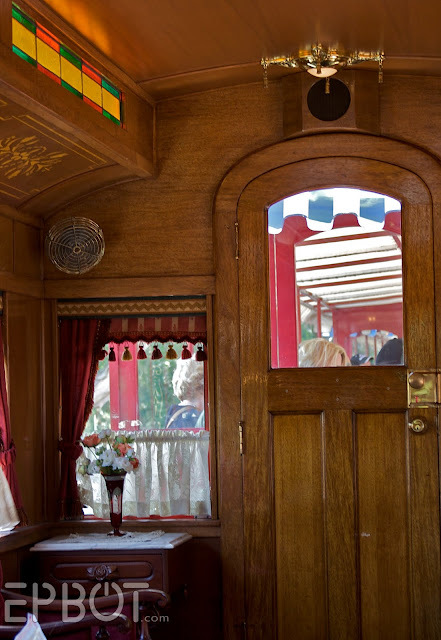 This train car used to be reserved exclusively for Disney VIPs, but nowadays you can make an appointment with the conductors to ride in it yourself. 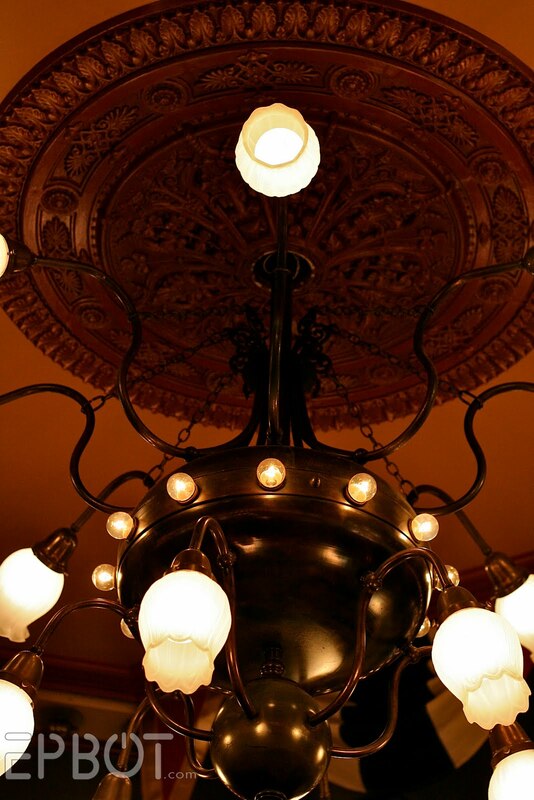 It's like stepping into another world in there: all velvet and antiques and wood paneling. Such a fun, insider-only kind of experience! I'm so glad we got to do it. And the final detail that makes Disneyland delightful: the cast-members! I'd say she's nailed "the look." And now, I shall regale you with two Matterhorn cast member stories. Me: "Excuse me, how scary is this ride?" Him: "Well, it depends. How old is the child?" Me: [without missing a beat] "Twenty-seven." Him: "Ok, you guys are coming with me." And with that, he walked us to the front of the line. (!!) If he hadn't, I probably never would have gone on the thing, and then never would've discovered my favorite ride in DL. During one of our many waits in the Matterhorn queue last week, John and I were amused to see a little boy get into a bobsled with his dad, and then pull his shirt up and over his head so he couldn't see. I guess he was scared. The cast member checking seat belts was using a flashlight to see into each sled (it was nighttime), and when she got to them, she leaned down and had a quick conversation with the boy. Seconds later, when the car pulled forward to start the ride, the boy was wearing his shirt back down, a big smile, and had the girl's flashlight clutched in both hands. See the little crown on the central peak? I just noticed that! Oh, and John and I did see the new show, World of Color, over at California Adventure. I took so many photos, though, that after narrowing them down I *still* have 100 to choose from. Hah! So anyway, I'll post a few of those next. I think you'll like them; the colors are bee-YU-teeful. Jealous! I love Disneyland. LOVE. IT. And it's definitely better than Disneyworld. Okay, so I have to ask because it's one of those almost haunting childhood memories of mine that I'm not really sure if it's real or not. You see, my parents took me to DL when I was around 2 years old. Anyway. Is that the castle you can actually go inside of (unlike at DW where it's just a tunnel) and it has a glass slipper on display in a case? And I agree with you, DL has way more charm and history (I'm a history buff myself). Unfortunately for me in Ohio, DW is closer. Really love the shots and it makes me want to go even more to see all these little details for myself. Thank you! Awesome...SO jealous though. I wanna go to Disneyland! I've been lurking since you began this blog, but had to pop up and say that this was a wonderful post! Great photos! I love Disney posts, since I'll probably never get to go there. If you don't already, you might want to follow bri-chan on deviantArt. She's a Disney cast member, and takes/posts all sorts of behind-the-scenes pictures of Disneyland. Your "pipe organ/player piano/band in a box" might be a street organ, which would normally be played by an organ grinder; what I could see in the picture looks similar to the barrel organ shown in the organ grinder article. I believe they can also be called a hurdy-gurdy, but I don't think that's its proper name. @ Tori - You're remembering correctly about going inside the castle at DL, but because it's Sleeping Beauty's castle I doubt there was a glass slipper. Cinderella's castle is in WDW. Speaking of which, we got to go in the DL castle for the first time last week; it was under construction or blocked off on our previous visits. Anyway, the renovated interior is *awesome* - lots of scenes telling the story of Sleeping Beauty. Too dark to photograph, but beautifully done! Is your music-thing a Nickelodeon? Glad you had a good time. The pictures are wonderful! Have to say: I've never been to Disneyland, but we go to Disney World nearly every year. Back when my sister was a good bit younger, she was scared of most of the rides - and had multiple cast members offer her a flashlight when they overheard us trying to talk her onto the ride. So much awwwww and love for cast members. I love when other people love Disneyland too! I live in Canada and have been there at least 8 times (I lost count) - every time I leave I want to go back within a few months. My plan for the next visit is fall 2011 after the opening of all the new stuff (Little Mermaid ride etc.). I can't wait!!!! I love Disneyland - even though I've only been twice. 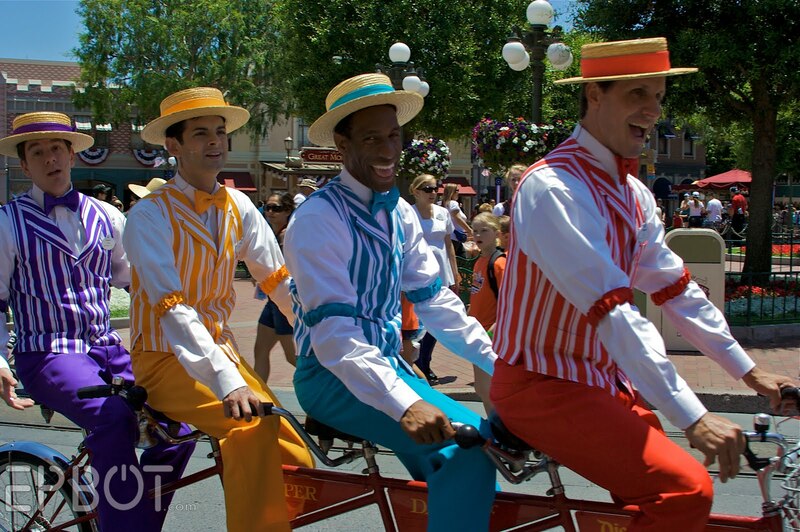 And the Dapper Dans are awesome. That is so great that they rode their bicycle for you. And the little boy on the Matterhorn with the flashlight forced a little tear in my eye. That is one of the things that makes Disney so special - is how the Cast Members can relate to a child (even a 26 year old one) and make them feel comfortable and empowered. Love your pictures! I am an huge fan of both your websites and Disney! But where oh where is the owl statue located!? I love owls and Disney and would love to take a picture of him too! I so love doing the photo safari thing at Disneyland. And it TOTALLY rocks over WDW. Not that I've actually compared for myself... some truths are just self evident. I wish I was as enthralled with the photo safari when I worked there back in the 80's. But I can do it now cause back then, I signed myself in and rode the rides. I don't feel the need to ride as much now! I started going to DL 42 years ago and saw it all from a stroller. Lived 10 minutes from The Park throughout my teen years. I still get the itch to return and when I do, to go get myself a costume and go to work! I would have loved to have been able to 'safari' with you. With my insider knowledge and your eye for detail... oh heck. We never would have gotten past the hub! LOL! I just wanted to tell you that since I was little (which wasn't too long ago... 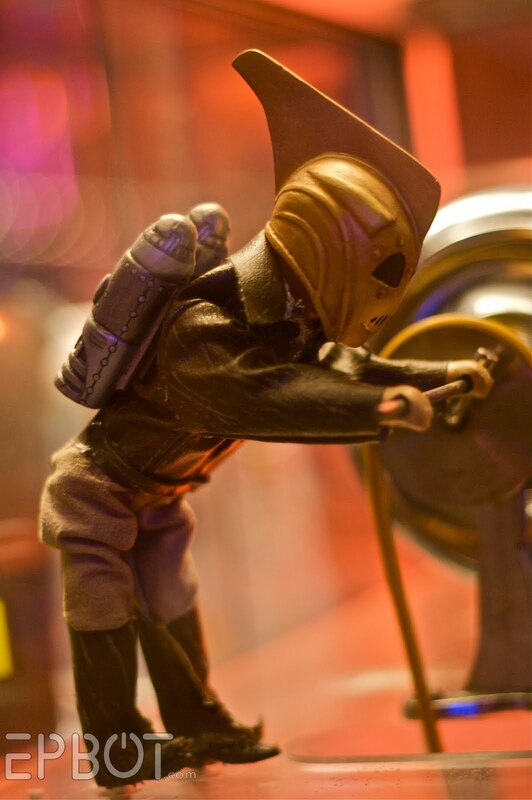 I'm only 25) I've LOVED The Rocketeer. My parents recorded it off of the Disney channel on VHS and I remember watching it over and over again. Matter of fact, I think I'll dig out my old copy and watch it now! The pictures are amazing by the way. Loved this post! History buff/Disney fan myself, so I really enjoyed all your detail photos. We frequent Walt Disney World in FL, but DL holds a special place for me - there's just some extra magic. I was lucky enough to catch World of Color 2 weeks ago on a business trip - looking forward to your photos and comments. My husband and I just went to WDW for the first time last month. As a Disneyland geek and pass holder for 10 straight years, WDW made me realize something. In all the research I did before hand, and all the exploring we did in the park, I realized I have been in a Disneyland rut!! I knew what I liked and stuck with that. I stopped exploring, I stopped looking around me. I came back from Florida determined to change that! I never knew about the Lilli Belle!! That is going on the list for the next time I go with my mom! I just discovered some new treats, the Matterhorn Macaroon is amazing! Tell me you tried one! 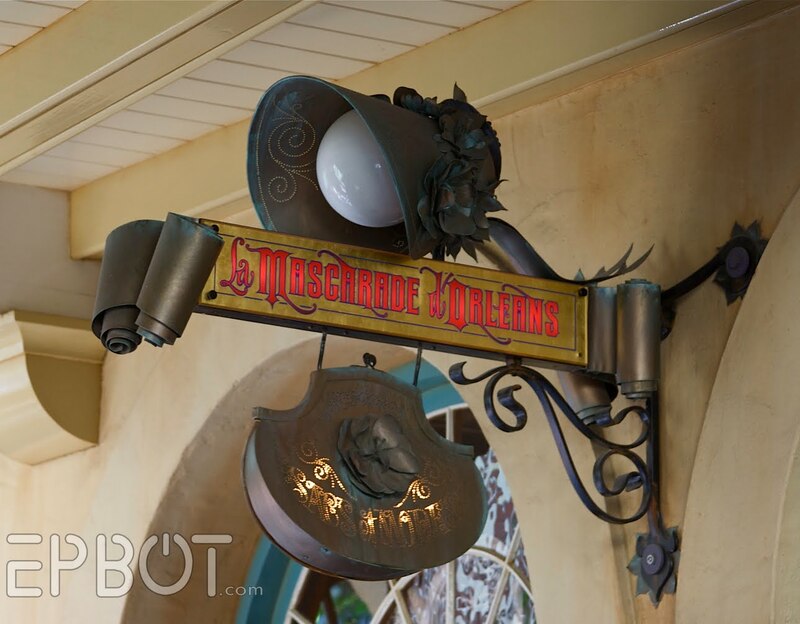 The pomme frites at Cafe Orleans are on the list for our next visit. My husband, not a disney geek at all, but an amazing, loving spouse, just renewed his pass so we can spend the next year exploring Disneyland together. We're just starting up our own website and I can't wait to blog on my year of discovery! So glad they are still doing the "little touches" that make the day special...we went 3 years ago and I was tickled that the cast members kept calling me "princess." I'm an overweight 36 year old. And I LOVED being called princess-made me feel 7 and pretty again. They also treated our two dogs to a free day in the kennel on our third day, our "magic moment", and when we picked them up, they had nice certificates for the dogs and an autographed photo of Pluto! Disney does it better than anyone! 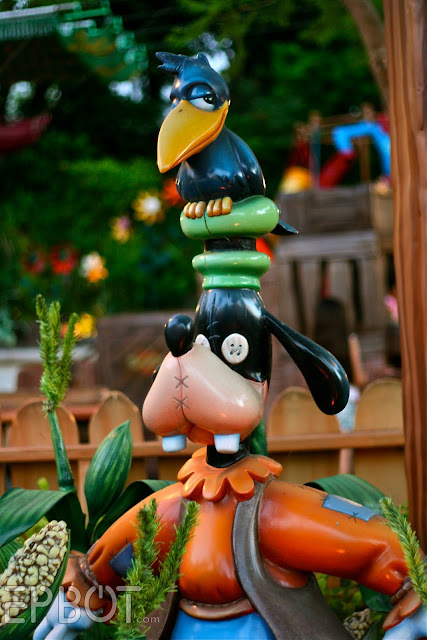 Also, I can't find documentation, but I remember hearing somewhere that the animatronic pirates in the ride were modeled after original disneyland cast members. And there are numbers on crates and barrels all over the ride... well those were various codes or phone numbers or something to that extent having to do with Disney offices or employees. Oh man Disneyland looks so beautiful. I really need to go back there and take my hubby. 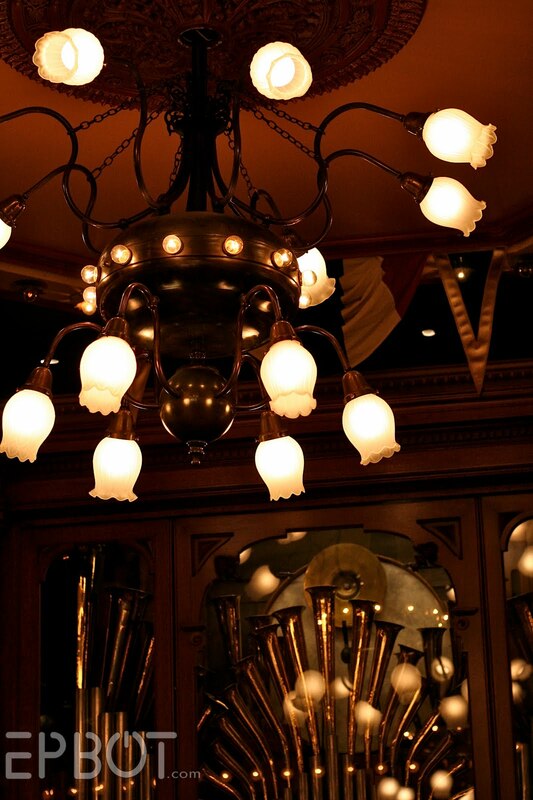 It has been forever since we went. Okay, that "music player" in the arcade is called a Welte Orchestrian (pronounced "Vel-tah" - the name of the guy who invented it.) Was built in Freiburg, Germany. LOVE that thing and drop a quarter in every time I go there....which is about 3 or 4 times a week. Yes, per week. I'm a season pass holder and I adore all things Disney. I feel so at home and, *ahem*, 'normal' when I visit your blog! Thanks for sharing your geekery with us! (Because to us it isn't geekery-it's just normal!) Disney rules! Jen, you should go to Madison WI and stop at Ella's Deli. The entire place is full of toys, many are mechanical and/or antique. We take our kids every time we go back to visit family, and I'm sure we haven't seen every detail. If you made Madison a stop on a CW tour you could maybe call lunch at Ella's a business expense. I'm going to go back and sigh over your pictures now. My one trip to DL was mostly spent waiting in line with my 4-year-old daughter to meet all the princesses. I live in So cal and have been to DL more times than I can count. You are a girl after my own heart! My guy and I LOVE going to Disneyland and revel in the little touches everywhere. Having gone to D-land with people less than appreciative of such details I am SOOOO excited to hear you not only noticed but love them as much as I do! I'm glad you enjoyed your trip so much! Remember- next time you come out this way I'll hook you both up with a Club 33 lunch! Thanks for sharing your pictures. I feel like I have been there too. Ooh, you're making me SO envious!!!! You would love the Disney archives. So much amazing stuff. Also, Club 33 is a kick. Jen, so, so glad that you were able to do the Lilly Belle after we told you about it. It is not always available (and they don't advertise it) so I am thrilled it worked out for you. And thanks for the link! We're 1.5 weeks away from our Convention. Tom Swift was created by the same man who created Nancy Drew and the Hardy boys and turns 100 this month. The Smithsonian just did an article online about us, but we could really do with more people knowing about us! Thanks! Oh! I forgot to tell you that a friend of mine is a cast member at WDW. He was several "princes" and Capt. Jack Sparrow last year (and such a good one that he was the spitting image of Johnny Depp as Capt. Jack!). This year he is the Snow Prince (Snow White), Prince Charming (Cinderella), Prince Phillip (Sleeping Beauty), Prince Caspian (Chronicles of Narnia), and Tigger. :) I have several photos if you would like to see any of them. He is great!! @ Elizabeth - [gasp] Oh, man, don't go dangling a Club 33 lunch in front of us - we might be there next week!! Hah! Long time reader (of Epbot and CW), first time commenter ... I just wanted to say that I love your new blog, your nerd girl rants, your DIY stuff and everything! Great pictures, Jen. It looks like you guys had a great time!!! Shoot, Jen, why is it always so dang fun reading this blog? Sure, I cracked up at the "shitzu wearing a popcorn tub" cake, but I enjoyed every little thing in this post. Glad you had such a blast at Disneyland! omg, your pictures are amazing! Can I insert some art student geekery and ask what kind of camera/lense you use? For pete's sake! I WORK at WDW, and you're making me jealous for Disneyland. Then again, being from the west coast, Disneyland will always be my home park. I've never been to DisneyLand, but we've been to Disney World 3 times and have got to agree about the cast members. They'll go out of their way to make sure your day is fantastic. To give one example, we accidentally left our son's sippy cup in a restaurant after breakfast and trudged through the park hours later back to the restaurant figuring it was gone for good. They had saved it, however, and my son was reunited with his sippy cup. The rest of the trip would have been quite difficult had we lost that cup. We were told the name of the woman, were told that she saves everything left behind and we thanked her on our blogs since we weren't able to thank her in person. Thanks Heather from Cape May/Beach Club Resort! So loving the new blog! I had no idea the "cake wrecks" gal would be someone I related too so much! It's cool enough that this Minnesotan travels there all the time with my family (hey it was a simple vacation but still a good time). I think you'd really love the mechanical instruments that play themselves. 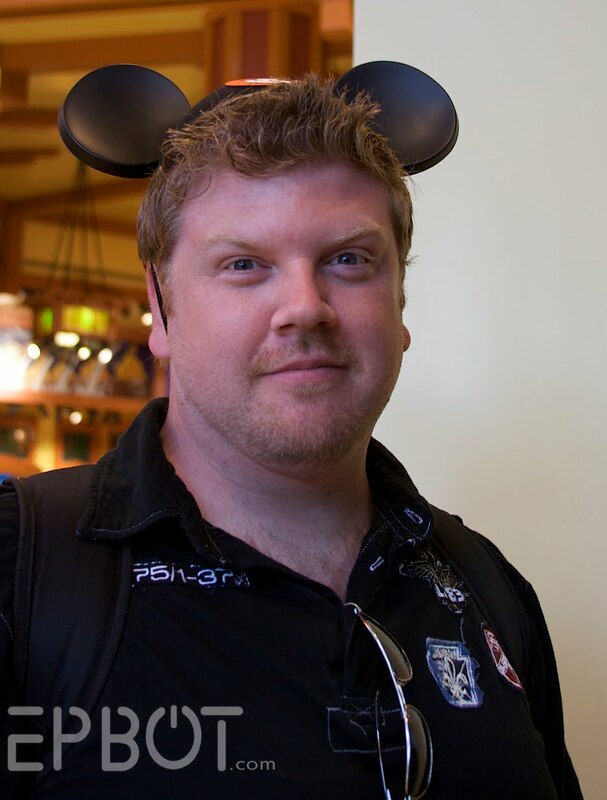 Very sad there was not a picture of you in Mickey Ears! One of my close friends is a new cast member at WDW (I think at Hollywood Studios are whatever they're calling it now) for their Disney College Program. She's not in Entertainment, but she's hoping to reaudition for it and extend into the next session. Your post had me thinking about her the entire time. Also, the last time I went to WDW a few years ago I nearly burst into tears when I turned the corner on Main Street and saw the castle. It's like my typical American suburbs childhood completely encapsulated and mooshed into building form. I grew up in FL and my hubby in CA. So when we married I had only been to WDW and he only to DL. For our honeymoon we went to Epcot. When our child was 5 we took her to DL and I LOVED it!!! I think the main thing I love about DL is that the park is compact so if you decide after riding Space Mountain you want to go to the Haunted Mansion you can with out a big fuss. At WDW it is so spread out that you have to do the park in order. Course hubby and child still haven't been to WDW, so we'll have to do that one day. sigh! Beautiful! 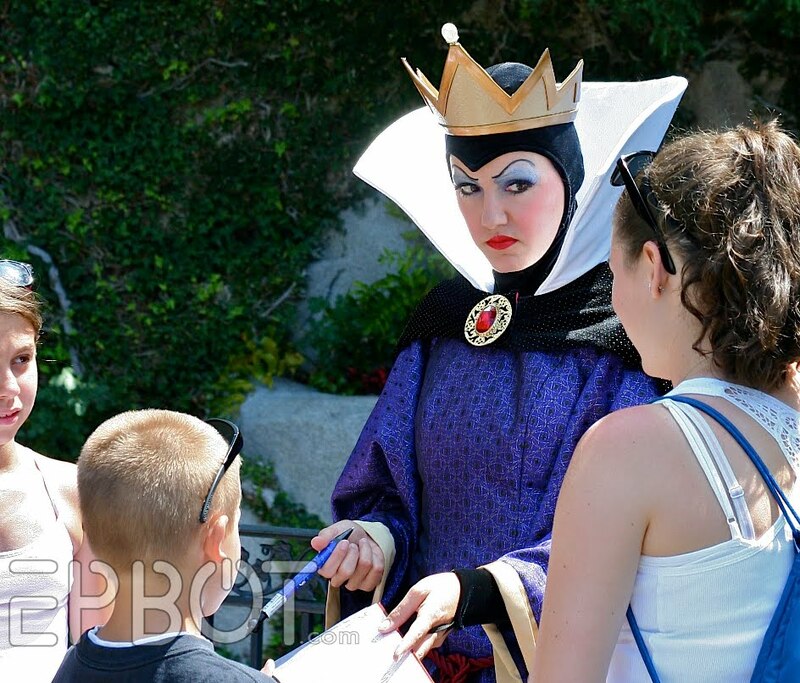 I have never looked at Disneyland like that. I love your pictures. Now, I want to go! All the cast members make sure that your trip is truly magical, and that is what makes it a wonderful place. Regarding the window display that particularly caught your eye: Squeeeeeeeeee!!! 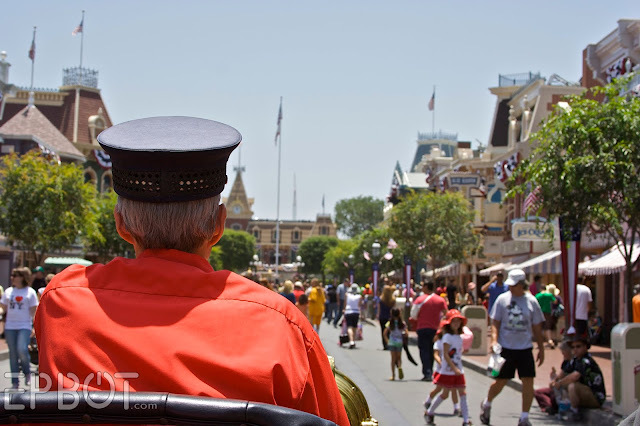 Next time you go, definitely take the Walk in Walt's Footsteps tour. My mom and I did that when we went in early June and learned things neither of us never knew. She's been going since she was a baby (she was born a month before Disneyland), I've been more times than I remember, we've both read a ton, and we still learned things we never knew. I enjoyed the pictures, too. What do you mean, ridiculously long? Frankly I didn't think it was long enough. I could read about Disney in any form all day long. I love love love the parks in all their incarnations. Thanks for sharing! Hi! My first job back in 1987 was as a food vendor in Disneyland. Training was a week at "Disney U" where you learned not only the details of your particular job, but an endless amount of history and trivia about the park. For instance, all along Main Street the second floor windows are painted with names - the paint is actual 24-karat gold leaf and all the names are personal friends of Walt Disney who supported his dream of Disneyland. The fire station on Main Street is an actual working fire station, because the city of Anaheim was so opposed to Disneyland at the time it was built that they put up as many obstacles as possible to keep the park from opening - one of which was a requirement that Walt Disney provide his own fire station. Another was the fact that no building could be taller than 2 stories unless it had a purpose, which is why there is a functional basketball court within the Matterhorn. I worked at Disneyland the summer after I graduated high school and have SO many stories and trivia about the park! Glad you had a good visit! Love your blogs! 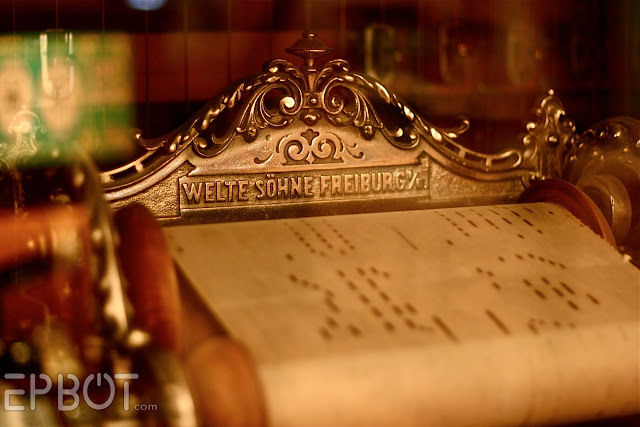 the Orchestrion is what the music box/player piano thing is called and if you really like these things then I would suggest you check out the nethercutt collection in Sylmar, CA. http://www.nethercuttcollection.org/ they have a large collection of working orchestrion's and nickelodions. They also have the largest collection of Concorse de elegence Cars in the world. Best of all it is free. however to see the orchestrions you need to reserve a place on the tour which is free but fills up quickly, you need to make reservations well in advance ( at least 2 weeks) but it is awesome. the whole place will blow you away. That does get an Awww! I live right outside of WDW but have only been a few times. You've got me hankering for a visit. Your stories and pictures are lovely! Thank you for sharing! 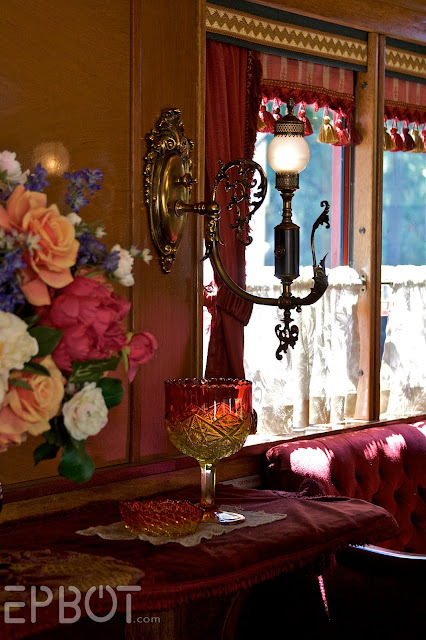 A friend of mine who works on the steam trains as well as in the opera house (who got us a ride on the Lilly Belle) told us that the little two-seater couch in the back right side of the car -- Nicholas Cage, Johnny Depp, and Orlando Bloom fought over sitting there, and guess who lost? XD Nicholas Cage! Hahah. Okay. Entirely too amused. Glad you had a good time! Love the pictures, and I can't wait to see what you took of World of Color! I loved it, but we weren't allowed to take pictures or video at the cast member preview. I actually had no idea about the Dapper Dan's tandem bike OR the Lilly Belle passenger car. Totally asking on my next trip to the park! 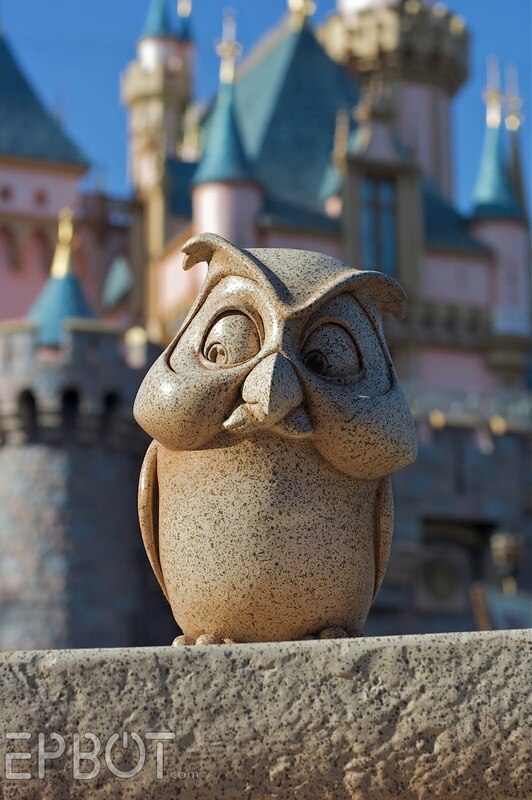 Oh dear, I love, love, LOVE that picture of the owl with the castle in the background. Would love to have a print of it! 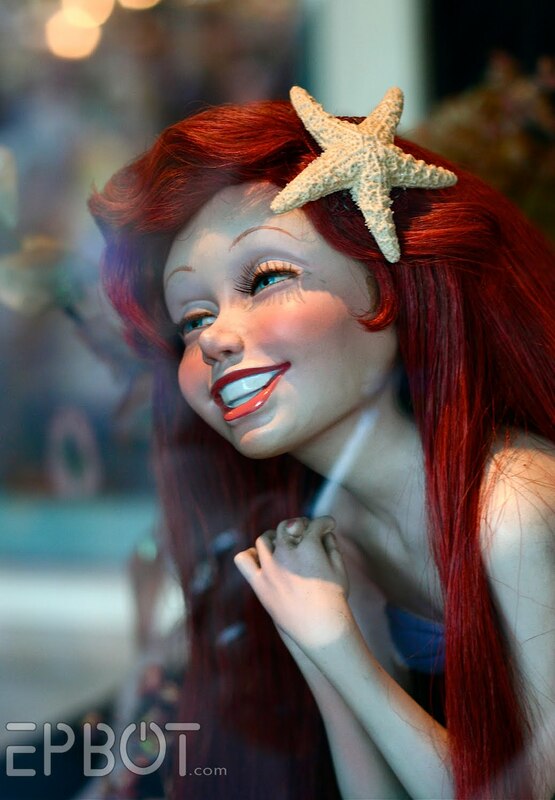 First, that Ariel creeps me out every time I see her. That's unfortunate, because Ariel is my all-time favorite! Secondly, this only adds to my utter impatience, because I am moving rather close to Disneyland a month from today! Woohoo! The organ player thingy made me think of a calliope. I love the music that a calliope makes. I was visiting my father in Holland several years ago and we went to Keukenhof, which is the most wonderful place if you love flowers. There was a calliope in the food court area that was playing songs from Grease. Hilarious, but also really cool at the same time! I love your castmember stories! I grew up a two hour drive north of Disneyland so I have a few of those myself. My favorite is from when I was five or six and absolutely terrified of all the castmembers in the big character suits, as well as being painfully shy. On a cold and rainy day I was getting Pocahontas's autograph and she heard about my fear. She sat down with me and spent a good ten minutes or so talking to me and gently convincing me that there were just people in all the costumes. She must have been freezing cold but she was very patient with me. I was never scared of the characters after that. Folks, Jen has it correct, it's "Disneyland". One word, capital 'D' all the rest of the letters lower case. Whew! I feel so much better now for clearing that up and getting it out of my system! Oh crap...can you believe I have never been to any of the Disney parks...How did I get to be 40 without that under my belt? Perhpas I will cave and get down there before I turn inot a pumpkin @ 411. You have definitely inspired men in ways that no one else could. Never been there but I am glad you got to go- you guys need a break every now and again! Wow your photos look fanastic. 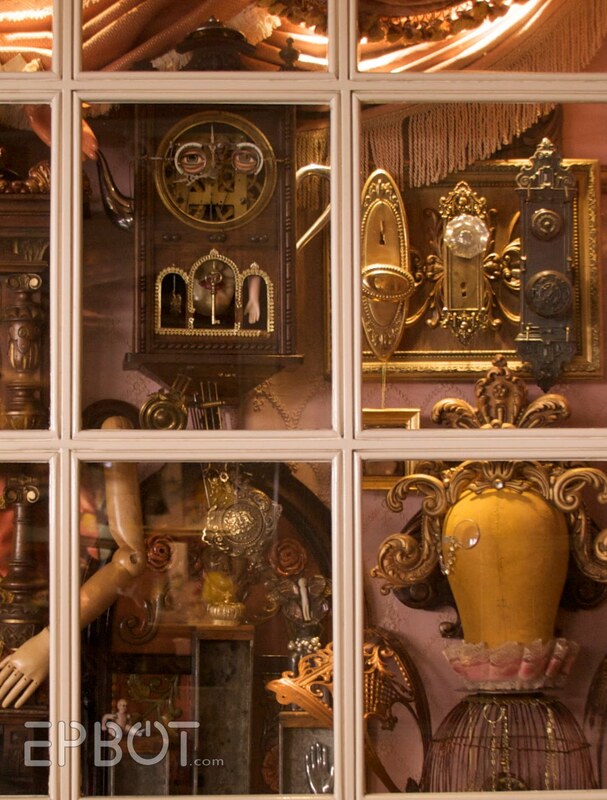 I could definitely see the Steampunk themes in your photos. Such wonderful detail. I am itching to get to Disneyland now. Though as a single mum with 4 children with disabilities it will take a while to save enough to travel the globe to get there. But until then I can enjoy photos like these. I am glad you had a great working holiday. I so am looking forward to making a trip out to DL some day. I've absolutely loved WDW every time I've gone (but I've only gone 3 times, as I live an 18-hr drive away). This post is amazing, and makes me hopeful that one day I'll be able to get out there. I did spend a day in Anaheim once, but there was no time for park-going awesomeness. Some day! It will be so. Sorry haven't been to DL yet so i'm all for WDW. Firstly: yes, John IS adorable. And quite handsome as well, you lucky girl. 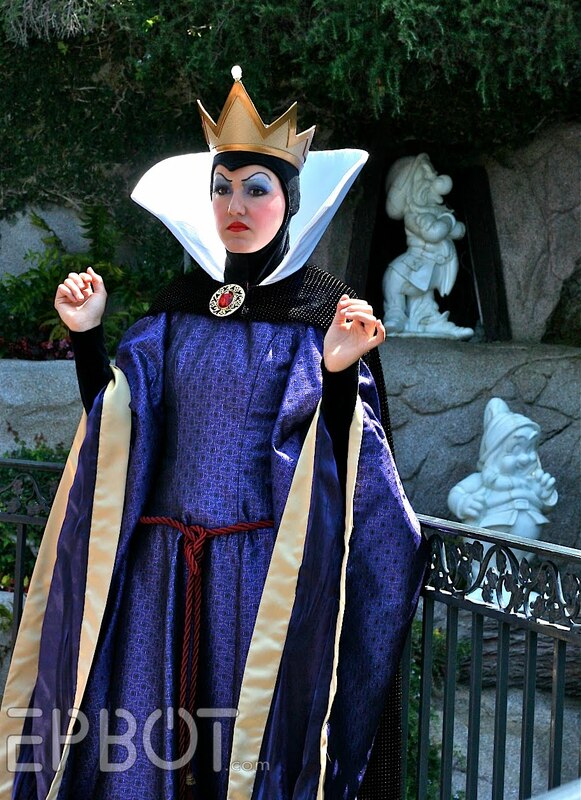 Secondly, you've kindled my desire to visit DL. I've actually only ever been to Epcot and plan to one day visit WDW. But DL is the original, you know? I love that they rode the bike for you. And I love BOTH Matterhorn stories. The Matterhorns is great and all, but Space Mountain ROCKS!! Did you know they speed it up at night? At least they did the last time I was there. We rode it about seventeen times in a row. It was awesome. Now I really want to go, but I don't have the money. Le Pout. The original Disneyland is the best. First trip was in '57 when I was 7. Been there about 40 times or so since. 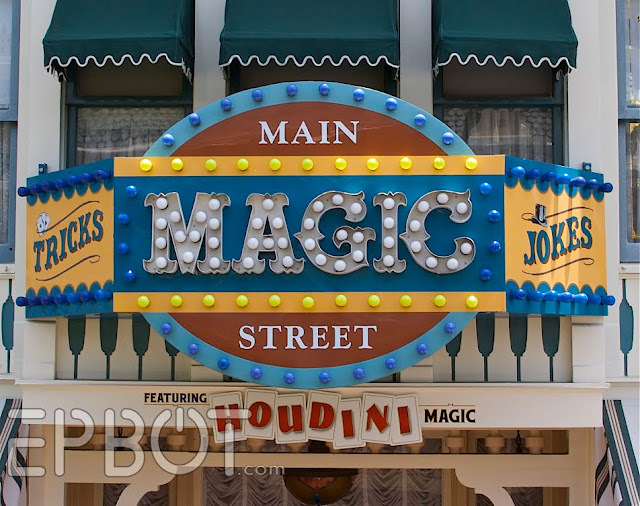 Miss some of the older stuff on MainStreet that they took away, but still love it. Need to go back very soon. Love it. I actually spent my 19th birthday in Disneyland (quite a few years back). The most surreal-yet-awesome moment of the day came when I was walking down Main Street and the Dans zipped by on their four-seater bike and sang out "Happy Birthday, Elizabeth!" I couldn't figure out how they knew my name, let alone that it was my birthday, until I remembered I was wearing that huge old Happy Birthday sticker they give you. It remains one of my best birthday moments ever. Another story, my sister & I flew out to California for my dad's 80th birthday, which also happened to be during Disneyland's 50th anniversary. We surprised him with a day at Disneyland. We spent more time walking around, taking the time to look at all the little details like you did instead of running around trying to get on every ride. It was the best trip there EVER! Totally agree about the cast members being the BEST source for info in the park. Wanna know the best seats for Alladin? Ask the cast member at the entrance. Wanna know where the closest restroom is? Ask a street sweeper. Everyone give a full sentence response and often will walk you to where you can see what you're asking about. It's another piece that adds up to makes the Disney experience just that... not just a trip to an amusement park, but a journey to another world. 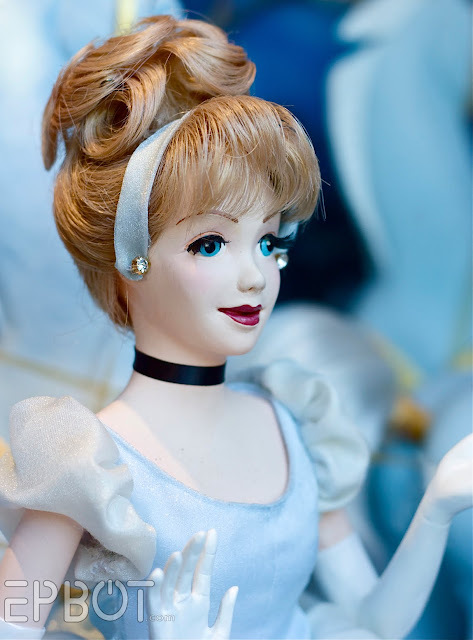 True confessions: I am NOT a huge Disney lover (although I do love many of their movies) and have never, ever wanted to go to any Disney park (not CA, not FL, and not France). I just have a problem with what I think of as "corporate fun." @ Mary Jane & Joanna - our camera is a Canon Rebel...something or other. (Ok, I just looked: XT.) Most of these shots were done with a 50 mm lens. @ Mary-Lynn - Oooh, we took that tour I think on our 2nd trip to DL, and yes, it was *amazing*. 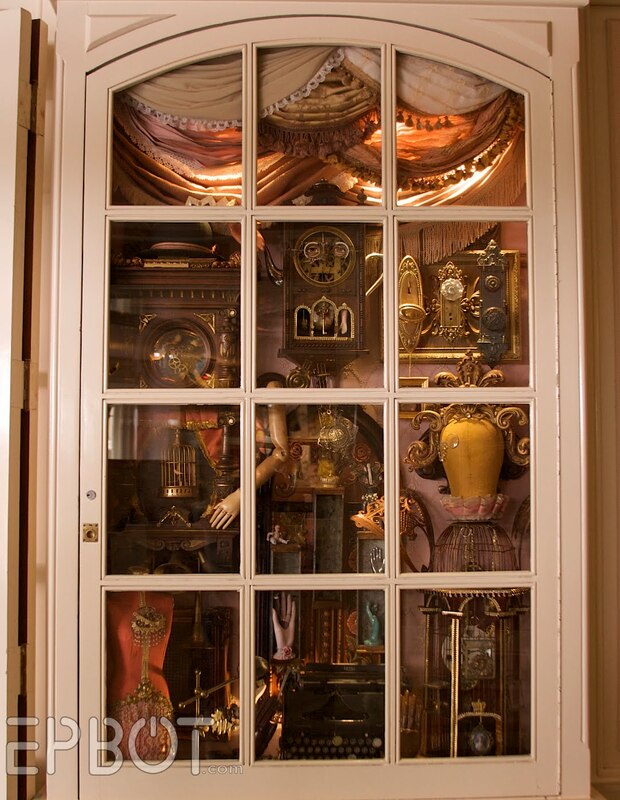 That was when we got to see the foyer of Club 33, in fact. So, so cool. @ Shannon of Cali - Yes, we did tour the castle; our first time! Loved it so much. I wish Orlando's had something similar. the little organ piano box is a nickelodeon, the jukebox of its time. it only cost a nickel a son! 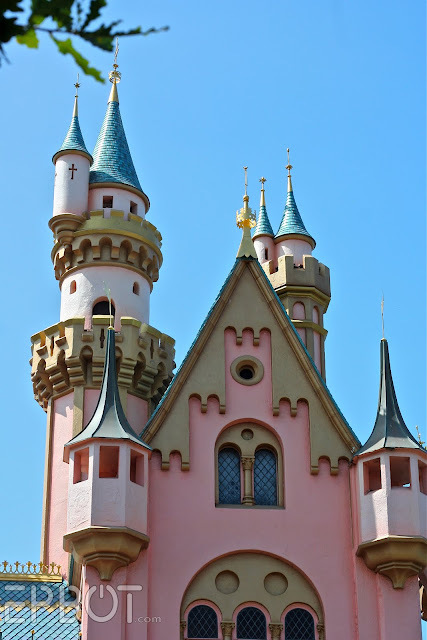 Living in SoCal, I've been to Disneyland a number of times, but I've never seen it look like it does in your photos. You make the colors pop. Another great time to go is in October when they have the Nightmare Before Christmas decorations up. Definitely geeked out over this post. I start working at Walt Disney World this August, so I've been on Disney overload lately. Glad you enjoyed D*Land! Us Californians are mighty proud of it; a lot of it has to do with the detail they put into it, like you just pointed out. Hm. 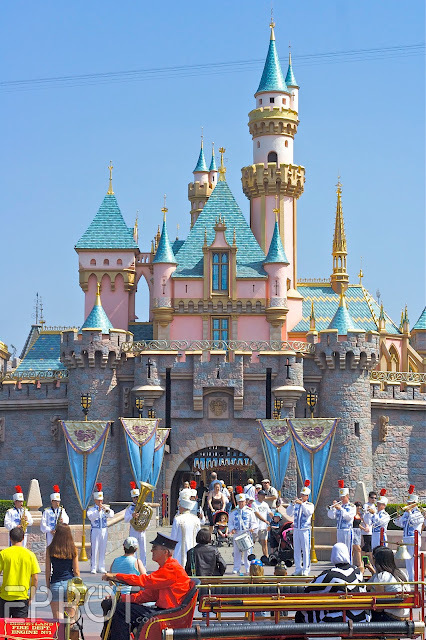 Being a Floridian, I never once thought of making a trip all the way to California just to see Disneyland. "What for," I thought, "when we already have Disney World here?" I love Disneyland! I just posted about it this week too. 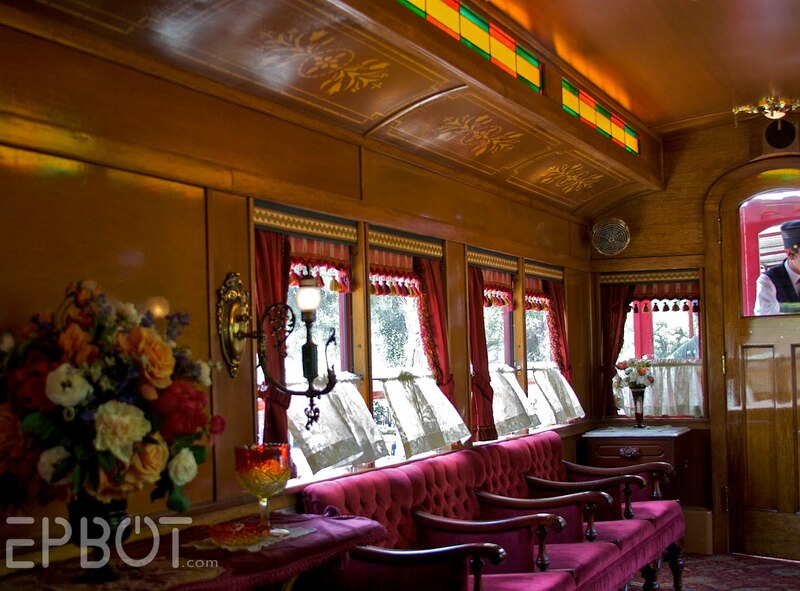 I didn't know about the awesome train car; that is a very cool experience that I will have to make a point to check out on our next trip. @Jen I will absolutely dangle that lunch! *dangles away* Just name the date (with some advanced notice (there are some non-memebr black-out days) and you are in. I go often and it is always better with poeple who are true Dinsey fans. I'll send you my email privately. I have to agree that DL is so much better than WDW. I know WDW had the "Magic Kingdom" but to me DL is just so much more magical. I think it has to do with the fact that it has city all around it, but once you pass under the berm suddenly all of that melts away and just doesn't seem to exist anymore. Thanks for the amazing Disney pics... gotta get there with the kidlets sometime. 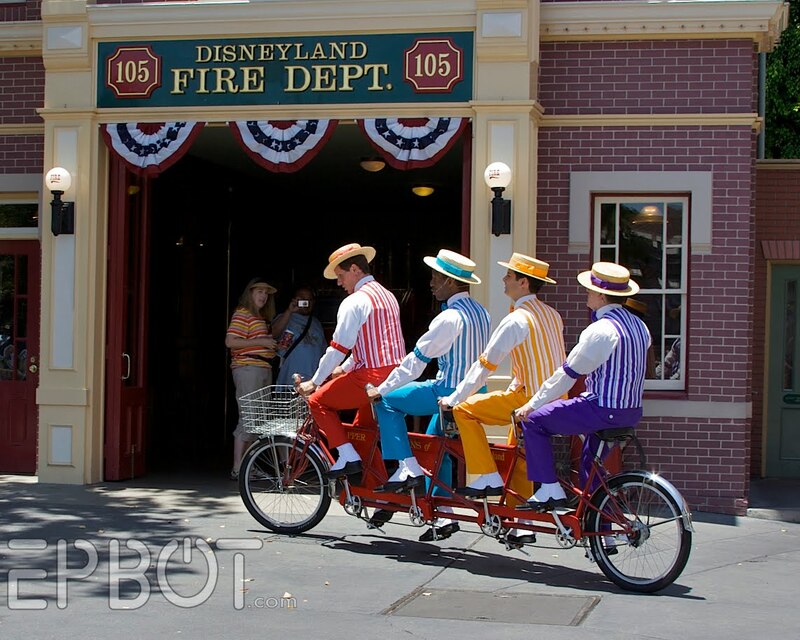 HERE'S geeky for you: when Hubby and I went to Disney World in '02, I literally FOLLOWED the Dapper Dans around to each stop on one of their afternoon jaunts. Told them I was a barbershopper and he smiled - he said EVERY DAY they talk to at least one barbershopper and they love it! Just found this today, but I had to comment. I am always thrilled to find other adults who are as giddy about Disneyland as I am. I usually don a tiara within minutes of arriving at the resort, and love that the cast members don't even blink to see a 40+ yo woman in a tiara, and they call me "Your Highness" without the slightest hint of a smirk. One of my favorite moments was when we were trying to have lunch at Goofy's Kitchen and were thwarted by a power outage. My then eight year old son was devastated. My friend went over to where some characters were milling about and mentioned there was a very sad little boy nearby. Aladdin came and sat down on the floor with my son, talked with him for several minutes and wrote a personalized note in his autograph book. I was so touched with his kindness. My husband is not quite the Disney fan I am, but we did spend one day of our honeymoon in Disneyland. (This was many, many years ago, when you could "do" Disneyland in one day.) I love that he humors me in my love of all things Disneyland. I love that you love Main Street! I was practically born in Disneyland - my parents met there - they were both employees at the time. I was pushed there in my antique pram before I even could talk. I have been there more times that I can even count. 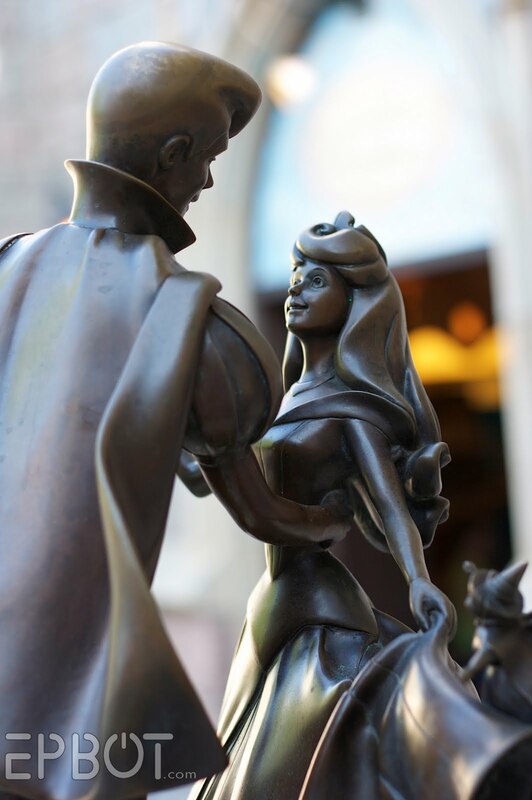 In recent years, i have become more interested in the little details like the statues, and the architecture. I never noticed the crown on the back of the castle, so thanks for sharing that! Great photos, and a reslly cool post. Oh my gosh! My cousin, Nathan is one of the Dapper Dans! (He's the orange one, wasn't in any of your pictures though). I've seen him dressed as one in pictures before, but I didn't realize it was such a big deal. We live in MN so I've never been to DL or WDW. So I was at Disneyland with some friends this last Thursday, and just want to thank you for this post. I read it some time ago and it stuck with me, because of all the little details that you captured in your pictures. These are things that I have never really paid much attention to, and now I'm starting to take notice. It is so awesome to discover new things with every visit. I consider myself very lucky because we live about 15 minutes from the park, and have a friend who works there, so we get to go pretty often. Since I've been on all the rides a million times, I'm finding it so much fun now to look at and find things that most others wouldn't. On this particular trip, it was my goal to find the Rocketeer guy on the popcorn cart. So of course, I had to check out every cart I passed until I found it ;) And I took pictures of all the characters on the popcorn carts...I never knew they even existed, let alone knew that each one is different and themed around the area the popcorn cart is in. Oh, and P.S...my new collection is pressed pennies/quarters!! I am loving it! I probably won't turn them into jewelry, but still love them! Disneyland is so good. And I, too, have a long list of reasons why I think that Disneyland is superior to Disney World- mostly having to do with the attention to detail and the cast members' kindness and knowledge. Loved your post. Now I want to go to Disneyland again! 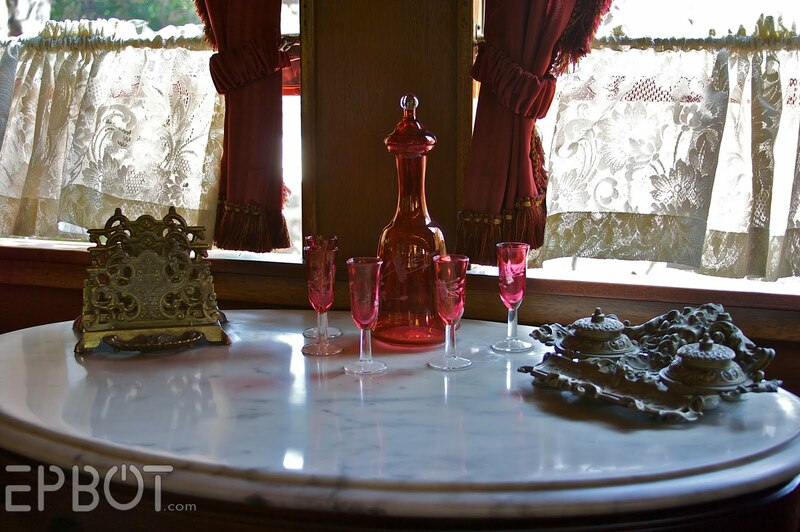 And thanks for the Lilly Belle Passenger Car tidbit! I <3 Disneyland! I have an annual pass, even though I live 8 hours away! I go every time we visit my parents! Blake (or Shamrock Jack) sent me to you and I instantly RSS'd! 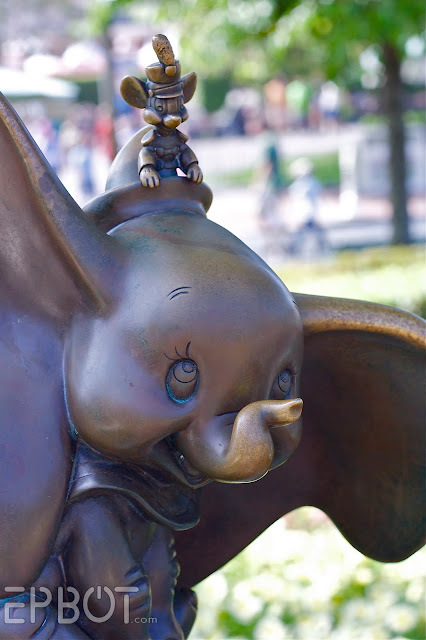 My Hubby took me to Disneyland 10 years ago and we had a blast, however I think next time I would love to spend time looking at the details instead of running from ride to ride. Thanks for all of your posts. Love your blog. I'm also a die-hard Disney fan. I live an hour and a half from Disneyland and agree it's my favorite of all the Disney parks we've been to. (I've been to Disneyland, Walt Disney World, and Disneyland Paris). I must say I love the gardens and spaciousness of Paris Disneyland. Worth seeing!